Few have analysed the extent of the pressure the workers were able to put up with for over fourteen weeks, because of the support they got from their own community. Nor has the involvement of Asian women in the strike been looked at. The strike broke out at Trinity Street factory involving fifty women and 250 men. Three days later, eighty Asian women from the subsidiary Clarence Street factory came out in sympathy. As one of them said at the time: 'The colour bar applies to us all. If our brothers are on strike we have to give them support. They need to feel self-respect, when they are treated like dogs how can we go in, if our brothers are out'. Soon, however, they were to come forward with their own demands concerning their own conditions. The hosiery industry as a whole has a 60 per cent female labour force - mainly white women. Asian women are at the bottom of the ladder even within this structure. The conditions exposed at the Clarence Street factory, which mainly employs female labour, emphasised this. In the low-paid cutting jobs, for example, almost all the workers were Asian. The charge hand and the supervisors were all white and treated the Asian women despicably - refusing to call them by their names, usually calling them 'oy'. They refused to listen to any of the grievances made by the Asian women - when a grievance was stated the usual response was to tell the Asian woman to shut up. Sometimes this made the Asian women cry. A white woman would never be suspended if her work was bad or if she behaved in an 'undisciplined' way. An Asian woman would often be suspended for two to three days. No allowances were made for technical problems in their work: if production difficulties arose out of the quality of the material and this affected their work, the loss of pay would not be compensated. White women workers were on an average wage - most of the Asian women worked on a piece-rate basis. This meant that they had to work much harder to ensure sufficient wages, because the white workers were assured of a guaranteed weeks wage - they could time over a job without fearing loss of pay. If a new style came in that the white workers found too difficult, the job was then piece-rated. The lack of English spoken by Asian women was used against them - apart from the day-to-day problems of communicating with supervisors and the problems of understanding instructions: in the hosiery industry the price for a particular article requires skilled haggling, and the Asian women complained of being forced to sign documents without being given time to understand them. Neither the management or union made any attempt to deal with this problem, not even by having interpreters who could explain matters to the workers. It was in protest against this degradation that these women marched through the town and occupied the plush union offices chanting Indian mantras, demanding that the strike be made official or else they would not move out. The Union were eventually forced to declare the strike official - on December 5th - and take the matter to arbitration. The women stood on picket lines to prevent other workers from entering the factory. the whole Clarence Street factory out in support added tremendous strength to the workers. After the Court of Enquiry had made known its findings on conditions at Trinity Street, the issues raised by the Asian women at the Clarence Street factory which had hitherto been ignored came to the forefront. The LeicesterMercury carried a report about the conditions at Clarence Street and warned that there would be trouble if something was not done. Asian women have been unhappy. Several women have complained that the attitudes expressed towards them have been racialistic. As you know there is no representation in the factory for workers, and no doubt this contributes to the bad relations there. There are other bad industrial practices engaged in at the factory but it would appear that they reflect a certain attitude taken towards people who are regarded as immigrants. We know for a fact that there is a great deal of restlessness in the factory amongst the women. We hope that through negotiations these problems can be tackled and solved." The Trade Union, which was shaken by the strike, began to move and at a public meeting gave an undertaking that factory representation would be instituted at Clarence Street. This turned out to be a long slow process: the women had little understanding of Trade Unions, and had little faith in them. But finally a factory comminee was set up consisting of fifteen members eleven of whom were Asian women from different departments. The workers now have a shop committee consisting of fifteen representatives, 11 of whom are Asians. Monthly meetings are held over different issues e.g. styles. The relationship between English and Asian girls is different: problems like pricing of articles are discussed together. Swearing has stopped. The Asian workers now have the chance to become cutters and overlockers, which was not the case before. Asian women are given a wages slip - again this was not done before. Some of the Asian women are now trying to learn English and some of the English women know a little Gujerati. 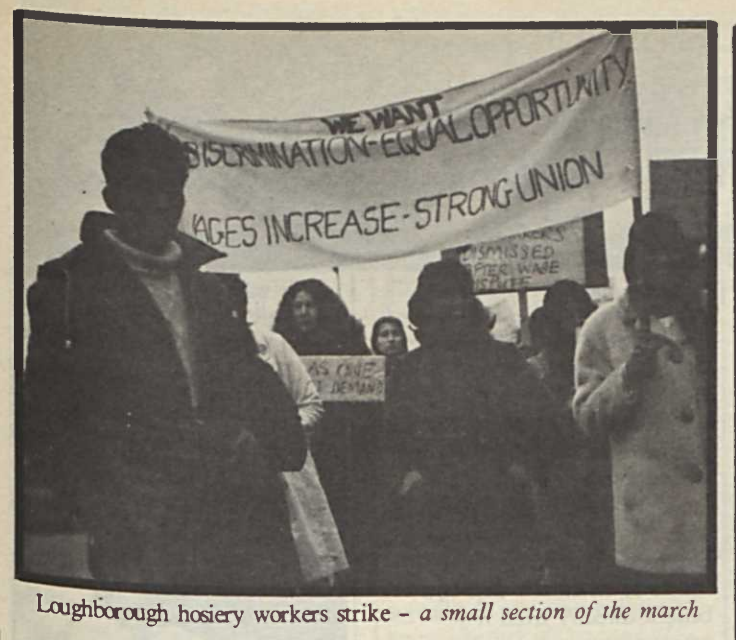 The strike finally ended when Asians were granted knitters jobs - but the strike had raised many issues, not least of which was the dignity of the Asians themselves as a people. A familiar slogan of the workers was "we will not go back like dogs".